So pleased to share that our newest collection of Bath textiles (shower curtains, rugs and towels) and coordinating accessories are now available at Kohl's online. I invite you to view our Lookbook, which features each of the 5 modern collections and links directly to our shopping page via Kohl's. Back in 2012.... artist and accomplished writer, C.J. Shane posted a review of my ink and watercolor painting, The Heart Surges. It's always a bit surreal/fascinating when someone looks deeper into my work and then offers their unique perspective. I love what Shane wrote...she understood the essence of my art which begins with my own layered approach to storytelling. It's years later now, and I have come upon her words again. I'm still honored by what she wrote and I invite you to read her review (below my painting post) and offer your own interpretation of The Heart Surges, if so inclined. Time this week, to begin working on some of the creative projects that have been on my list for a while. Ink is cool, because it flows as it wishes. It's a lot like watercolor...maybe more headstrong, though. I did spend a good deal of time trying to manage it but eventually gave up on that and enjoyed the unruly flow. Ink is messy by nature. I am still finding splatters of indigo and moss. And while I'm here, let's talk about this palette. I only had three ink colors in hand which meant I had to work with what I had...which felt surprisingly ok. Yes, my eye generally prefers my ocean colors but these, in their own way, still feel soft to me... just in a different way. I like the monotone melding where the overlaps occur amidst swirls of ink. I really like the organic shapes, lines and edges. I love that it was something new. More work/play to be done, I think. I post most frequently on my Instagram and facebook pages... I invite you to follow me there. A few things about fresh clams I learned along the way... Preferably, cook clams the same day you buy them. Do not store them inside the plastic bag from the supermarket the day you buy them thinking you will cook them 2 days later... or you will suffocate them...like I did the first time;) So, buy your clams same day and when ready to cook, rinse them well in cold water. In a large mixing bowl, make a brine by adding 1/3 cup of NON IODIZED salt ( iodine will kill your fresh clams...) to a gallon of cold water...stir and add clams and let them soak for 20 minutes or so...this helps them release any sand/grit that they might have inside their shells. Rinse well under cold running water, toss any clams that have cracked shells and clean any shells that may have debris attached. Then, set aside while you begin cooking the sauce. Pasta of your choice...I like orecchiette with this dish because they are like little scoops that catch the broth really nicely... much easier to eat than spaghetti. Boil water to cook pasta of your choice. Heavily salt the water once it comes to a rolling boil. On Medium high heat, heat olive oil in a large pot. Add the onion and mushrooms and cook for 3-4 minutes, stirring frequently. Add garlic and jalapeno pepper and cook 5 minutes, stirring frequently so the garlic does not burn. Add the wine and cook for another 3-4 minutes. You want it bubbling so the alcohol boils out a bit. Turn the heat down... then add in the can of tomatoes, water, bay leaves, salt and pepper to taste... simmer over medium low heat for 15 minutes. Turn the heat back up to medium high and add the fish...cook 3-4 minutes. It will flake nicely into the sauce as it cooks. Add in the clams, cover the pot and cook for another 5-8 minutes. Stir once or twice. The clams will begin to open up as they cook. Cooking time is dependent on the type of clams you are using, but generally, when most have popped open wide, it's done. You don't want to overcook clams or they will get rubbery. Discard any clam whose shell has not opened as that means the clam inside was probably not happy and healthy from the start. Use a bowl as this is a brothy meal. Layer Orecchiette pasta into bottom of bowl. Spoon red sauce and clams over the pasta. Sprinkle with fresh basil and fresh Italian parsley. Add a light squeeze of lemon. Garnish with nice crusty french bread... I like to brush the bread with olive oil, a little dusting of garlic powder and fresh parmesan cheese...broil until golden brown. NEW bedding ensembles hitting stores this week! Proud to share that our two newest collections, Soft Repose and Sea Glass Mosaic are now available via Bed Bath and Beyond online! The collection offers Reversible Duvet sets, shams, decorative pillows and coordinating quilts. 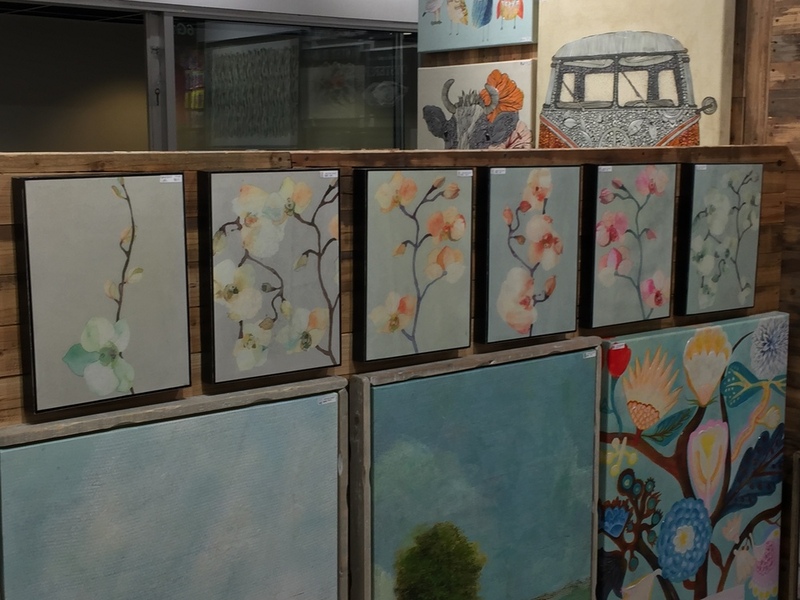 Each piece features lovely detailing, such as embroidery and watercolor tonality. The Duvets have launched first and the decorative pillows and coordinating quilt sets will be added to the BBB site soon. Great to see some new product up on the BBB page and looking forward to new retailers jumping on board and carrying the collections in time. My favorite quilt is still on back order... can't wait to share some pics along of that one... soon! Introducing our newest fabric by the yard collection, Soft Repose! Ever inspired by the fluid grace of nature, Soft Repose pays homage to subtle patterning and graceful lines. 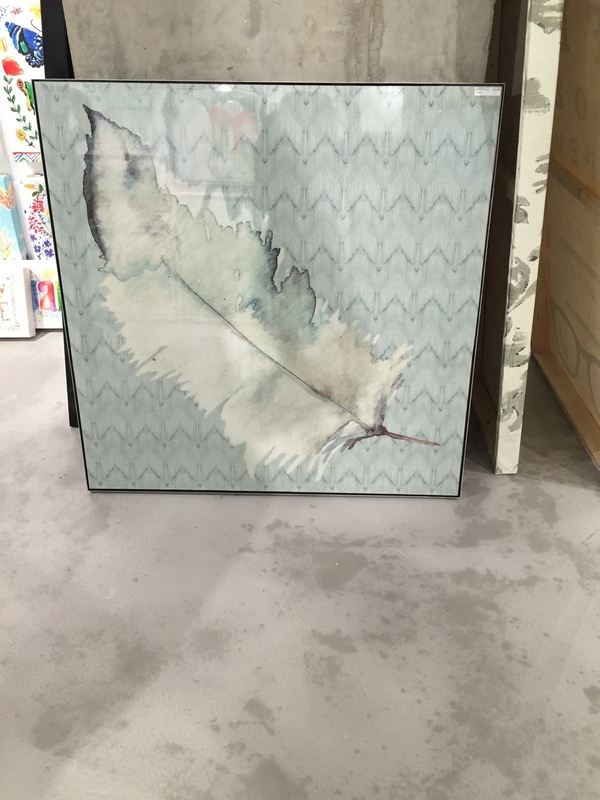 It's a livable collection of soft, graceful, organic designs and its quiet palette features a full range of tonal grays, enhanced by the unique translucence of hand painted watercolors. 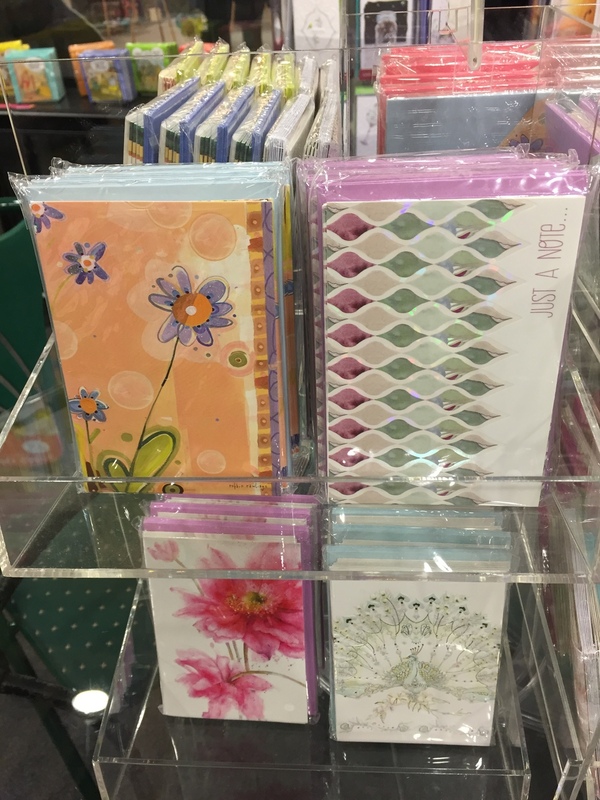 My agent team was kind enough to send me some pics of our product lines as they came upon them in the Atlanta Gift Market Showrooms. 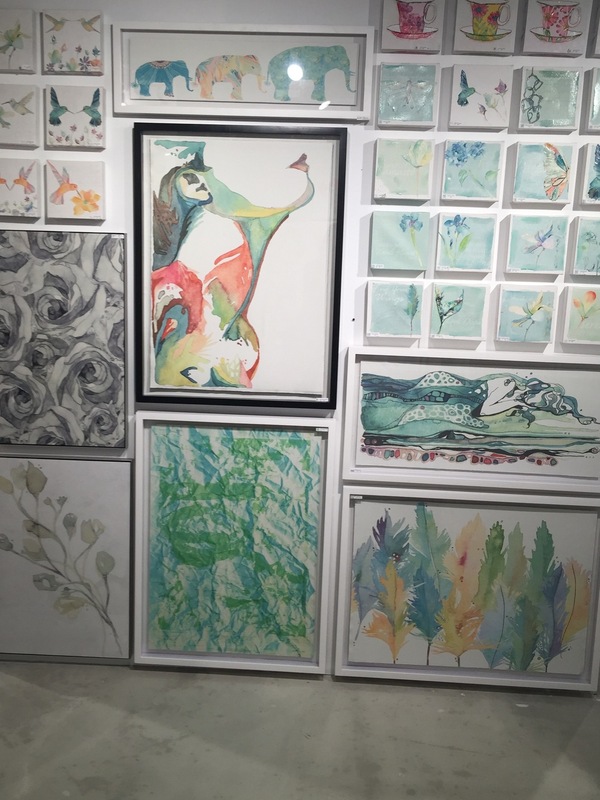 A really large selection of wall art, both embellished canvases and printed reproduction watercolor paintings under glass made a nice showing. 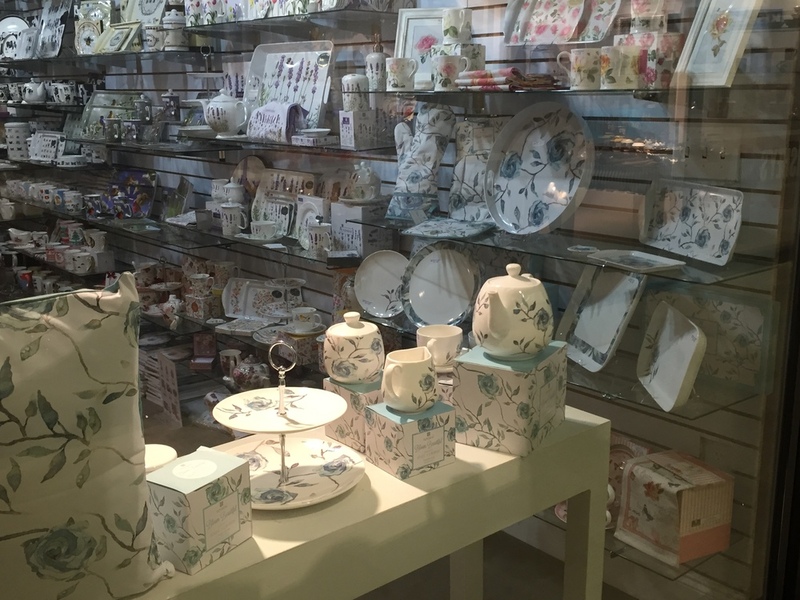 Our lovely Bloom Beautiful bone china collection was prominently on display, as was an assortment of stationery items featuring my artwork. I'm just back from High Point, North Carolina, visiting the awe inspiring Surya Showroom and viewing the launch of my long awaited rug collection which has been in the making for over two years. Patience, I always say, rewards...never truer words. My rugs... 8 x 10" wool rugs, hanging side by side, catching the light so beautifully...shimmering and soft. The Natural Affinity collection, named for the natural organic compatibility between ocean currents and layered tidal seascapes, truly did me proud. Each rug in my collection honors the feel of those natural modern abstracted coastal elements and feels both relaxed and sophisticated. 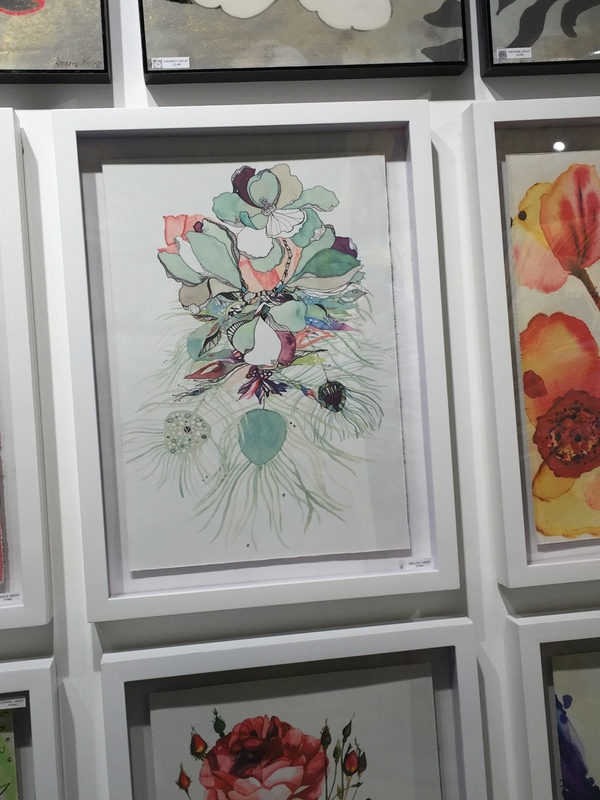 Surya's artisans translated my watercolor paintings into wool, beautifully. Also launching at Market, our silk pillow collection, many of the designs meant as coordinates for the rugs. The silk is sumptuous and touchable and the perfect material to enhance the watercolor feel of my work. Each brushstroke in all its translucent glory, comes through. So pleased! While there, we had a fantastic design meeting with Surya's VP of Product Development to discuss my vision for several new product categories as well as receive an update on our second rug collection which is being sampled now! The new concepts, which were met with enthusiasm, will be a wonderful way to round out my offering in the Surya Showroom. I will share along more, as it all unfolds. Both Shell Rummel rugs and pillows will be available via retailers as well as online shops, soon. I'll be sure to keep you posted. For over two years, my design team and I have been working and waiting on the launch of my first collection with industry giant, Surya. A dream of mine, to design a line of rugs that feature my natural, organic art. The Natural Affinity rug collection will launch at High Point Market next month. The collection features an assortment of abstract organic wool rugs, all with my signature design aesthetic. A lovely collection of silk pillows will also be available to the trade. Surya's Press Release has been distributed to over 300 Media outlets. It was picked up by several of the Trade Magazines including Home & Textiles Today, HFN, RugNews, Home Accents Today and Furniture Today. Back from the Westpoint Home showroom in NYC and filled with pride as my two newest Bedding collections have launched to the trade during Spring Market Week. Always a labor of love, our collections feature sophisticated and tranquil palettes, beautifully intricate embroidered detailing and the softest cotton hand. Both offer a casual chic, modern coastal vibe. Warmest thanks to the WPH team for displaying my collections so perfectly! The vignette was stunning and the beds looked right at home. New Shell Rummel Bedding Collections will be available via retailers in the Fall of 2016. Thank you, Home & Textiles Today! Very happy to see such a lovely feature article in the March 7, 2016 Pre Market issue of Home & Textiles Today. Spring Home Textiles Market in NYC begins in just a few short days and I am planning on being there to visit my showrooms and see the launch of our newest bedding and bath collections. It's the culmination of months of hard work and I look forward to seeing how our newest bedding textiles have come to life. The feature article can be seen in full, here. Although my design business is always about creating a product that is appealing and sellable within a particular market, the majority of my paintings through the years have been created for me, without thought of resale. Rare, for me to want to sell an original work and in fact, I have gently denied a request to purchase my art on more than one occasion. I paint because it fulfills me to create...an idea, emotion or feeling that needs to be expressed via my hand and the beautiful flow of water or ink. If there is any resonance for the viewer, I consider that an extraordinary gift in itself. And if someone happens to fall in love with one of my paintings, choosing it to live with them... well, that's a rather epic honor, indeed. I have spent some serious time building out this shop page;)) Perhaps the delay is due in part to my own hesitation to part with some of my work. Each time I paint, a part of myself becomes one with the layers. I can usually recall with vivid clarity the circumstances around how a particular painting came to be...the story that connects it to me. I've been able to revisit so many of my paintings from my earliest portfolio, remembering the stories from those moments and seeing the evolution in my work. It's pretty cool and confirms my growth as an artist. Each is hand selected...a painstaking process if you know me. I will add new paintings to the galleries as I am moved to do so. I expect the Originals gallery will have a more substantial selection over time as I hope to share older works that are special to me as well as new work right off my watercolor pad. It's true that not all originals also happen to make excellent reproduction prints, so I will only offer a print if the print quality is exceptional. I labor over the decisions of which pieces of me to share along and I feel immense pride when my art is chosen. I hope my work moves you. I am a summer girl, much preferring warmth on skin and long golden days to cold and ice and the bluest of light. But admittedly, there is something quiet and lovely about the snow, too. It’s a short-lived feeling, but I try to honor it still, via my photographs. The daily walks in search of the beautiful helped me cope with 4 long days and nearly 3 feet of snow. Here, a sampling of the gorgeous glimpses of (almost tide) lines, shadows, hollows, edges and ridges that the wind drift provided. More, on my Instagram feed and Facebook page. As I sit here with the sunlight streaming into my studio, first time in a week, I am warmed by the light...happy in the moment. I've had a great week in the studio. It's been quiet and peaceful and I focused on updating my website, painting, drawing...even got a little messy with scissors and glue as I tried my hand at some collage work. I have lofty goals for the New Year, some still forming... There's so much I want to achieve, both personally and professionally and it will be a pleasure to share more about my intentions in the coming weeks. As for the year that's ending, it was a beauty in many ways. 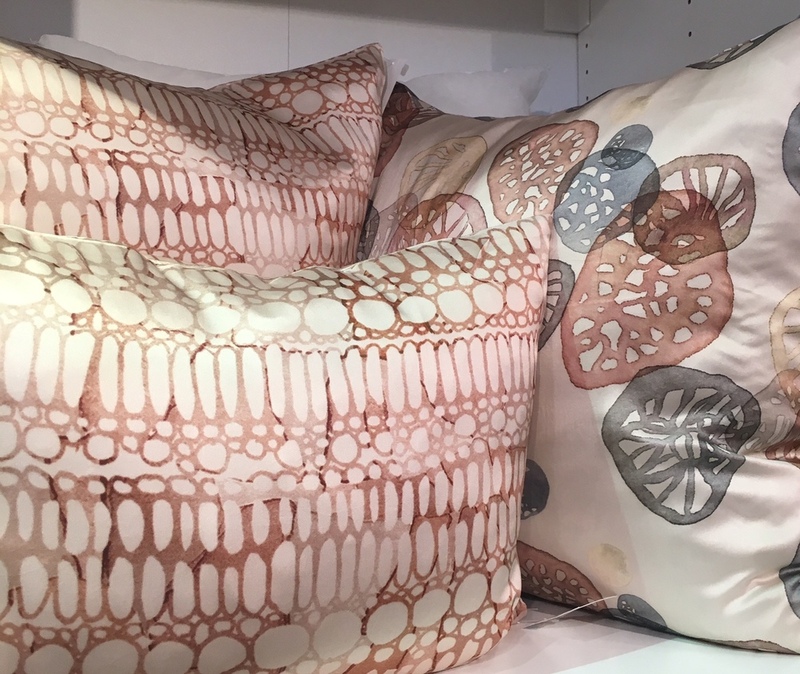 The Shell Rummel brand continued to grow as our bedding and bath collections finally made it to the shelves of industry giant, Bed Bath & Beyond. More dot coms followed... and with it, the promise of more product... bedding, silk pillows, gorgeous wool rugs, shower curtains... We are currently working on new collections inspired by my love of organic lines and natural patterning, but also, no doubt, by my travels to Edinburgh, Scotland this past Fall. Months later and I am still feeling the calming effects of my time away...profound, how the magic of a place can stick with you and make you look at the world with fresh eyes. My time there deserves its own blog post with some special photographs shared along to tell the story visually...Adding this to the lofty goal list for 2016. Years ago, I owned a fine art production studio. 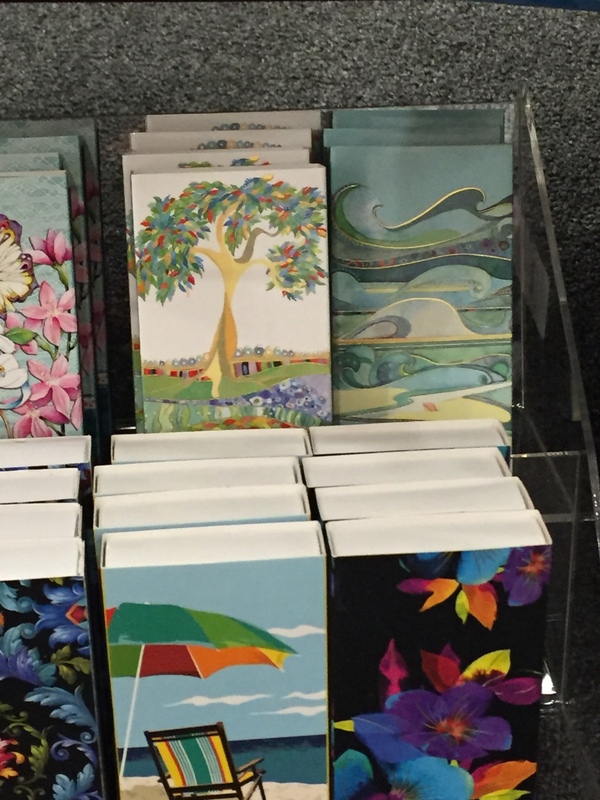 My team produced and sold literally thousands of Giclee Prints of my work to stores and galleries across the country. The slow dance of color matching each print to my original watercolor paintings...adjusting color and saturation, choosing the right paper, inspecting prints closely for perfection before adding my inked signature to the page... there's an integrity in the process of ensuring the print was as faithful a reproduction as I could make it. That meant something to me back then. And still does. My growing brand takes much of my time and energy these days... I do get a bit giddy designing products for a list of spectacular licensees. But so many have written me this year; some who randomly stumbled upon my work on Pinterest, facebook or Instagram... Some who fell in love with my bedding or fabrics... and some friends who have been collectors for years. The common theme of all those emails was asking if I would someday offer for purchase my originals and reproduction prints of my work. And those who know me well, know I don't like to disappoint... so... a Shop page is being built (so, so close to being up and running) and I will once again dip my toes into production and offer up a small selection of artwork. You can expect to find a small but well curated assortment of original works that I would love to see hang in a new home... as well as a revolving handful of new fine art prints...mostly limited editions, all hand signed by me. The painting above... well... that's the second in a series. The first, I'll be Right Here... is my "Most Pinned Pin"on Pinterest (which has apparently inspired and sparked the creative juices of many this year.... another post about that, coming soon;) and so I will be making this print available on my Shop page, too. I hope you'll check it out once the page goes live and see if any of my art calls your name. I'd be honored for my art to live with you..